A flight attendant made my day last night on a late evening British Airways flight. I’ve been traveling within Europe this week and was on a flight to London last night in British Airways shorthaul business class. Dinner was served after takeoff, which included a choice between two types of salads. A couple hours earlier I had enjoyed a huge seafood lunch and was really not in the mood for eating. Well, with one exception. There’s always one thing I enjoy eating when flying British Airways. That’s a scone…or several scones. Scones may be full of calories, but there is something about a hot scone with clotted cream that represents one of the simply joys of life. If you don’t ask you don’t receive. I asked a FA if there were any scones leftover from the flight from London. She seemed almost startled by the question, but cheerfully volunteered to check, warning me that they were likely already thrown away. Score! Even the clotted cream, which I did not even request! She even heated them up. What a nice gesture! And they were delicious as well. I had to stop myself at two, trying to somehow maintain a healthy lifestyle during a hectic travel schedule (I’m not doing a great job). What’s the path to loyalty? 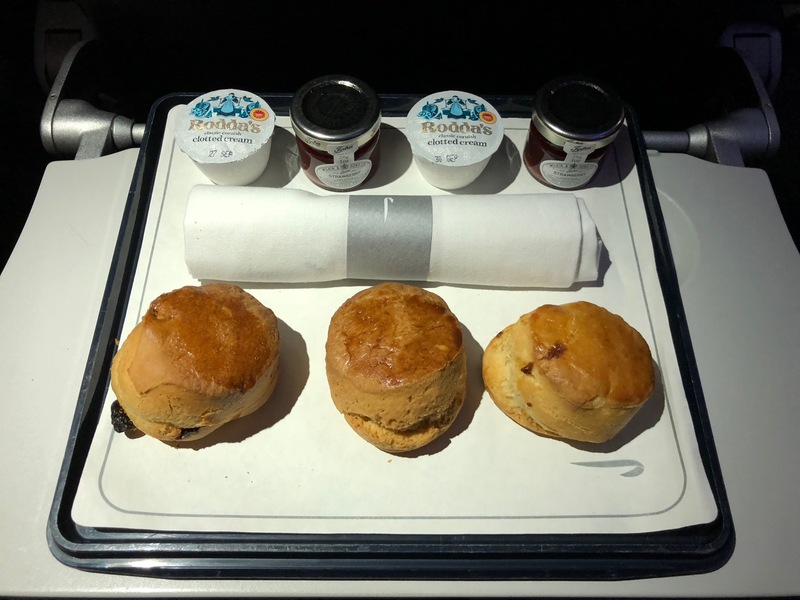 In the case of British Airways, a hot scone. Comfort food for British upper middle class types. Paging Oscar Munoz? READ THIS CRITICAL ALERT! United could really use that kind of extra service, and if Oscar hears a story like this, maybe he’ll do something about it. They keep Oscar away from the travel columns. His new heart would not be able to take the comments. The path to loyalty is always doing the unexpected for the client. I agree. A few years back, a FA in American first (international) saw my son’s disappointment over missing out on his dessert choice and offered him her slice of chocolate cake from her own lunch bag. He still talks about that. Also on American, I had a FA had me a bag containing a bottle of wine and a couple of cookies, telling me to enjoy myself later. I’m with Ed and Heather. Back in 2000, flying Delta (or maybe it was NW) from Paris to DTW near Valentines Day, we were flying through turbulence and the duty-free carts were wheeled back and locked up before they got to me. Explained to the FA that I wanted to bring my wife something nice off the cart, and finding out she couldn’t free the Godiva chocolates, she brought be a bottle of champagne, and wished a happy Valentines to me and my wife, compliments of the airline. What website do you use to check British Airways’ rotation schedule, especially regarding the aircraft from London-based preceding flight? LOL. Brexit disaster?! More like a Brexit Success!